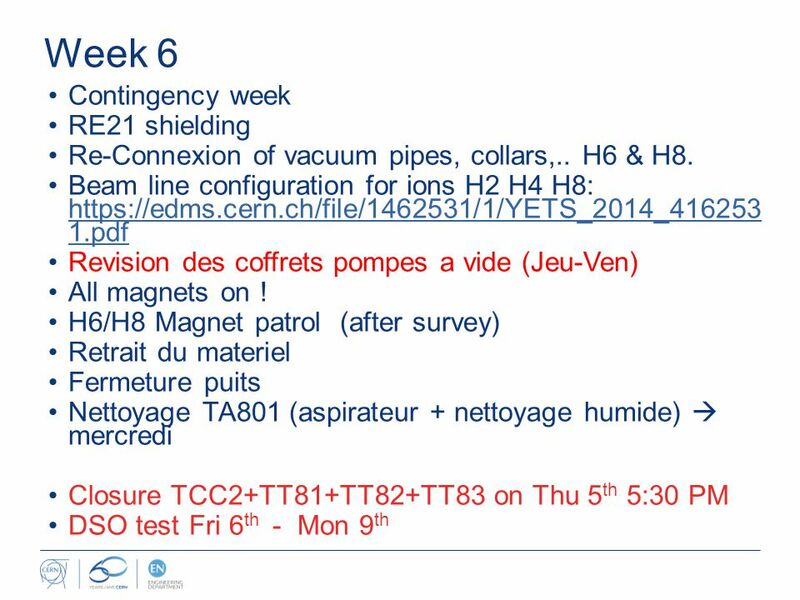 NA 2014-2015 YETS: schedule week by week S. Evrard. 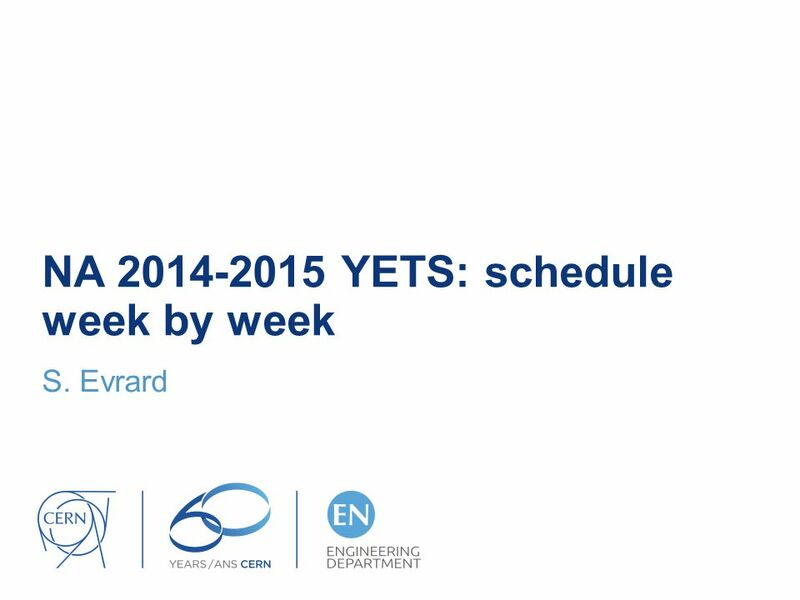 Download ppt "NA 2014-2015 YETS: schedule week by week S. Evrard." 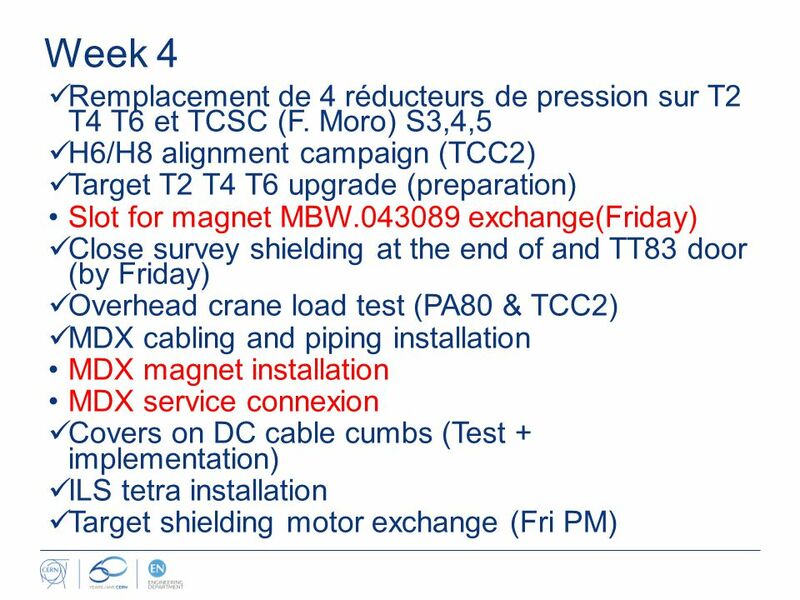 EN/STI investigations during LS1 in TDC2 and TCC2 TDC2: -TCSC (collimator) to be replaced if … TCC2: -Targets Stations T2-T4-T6 *Monitors and Target equipment. 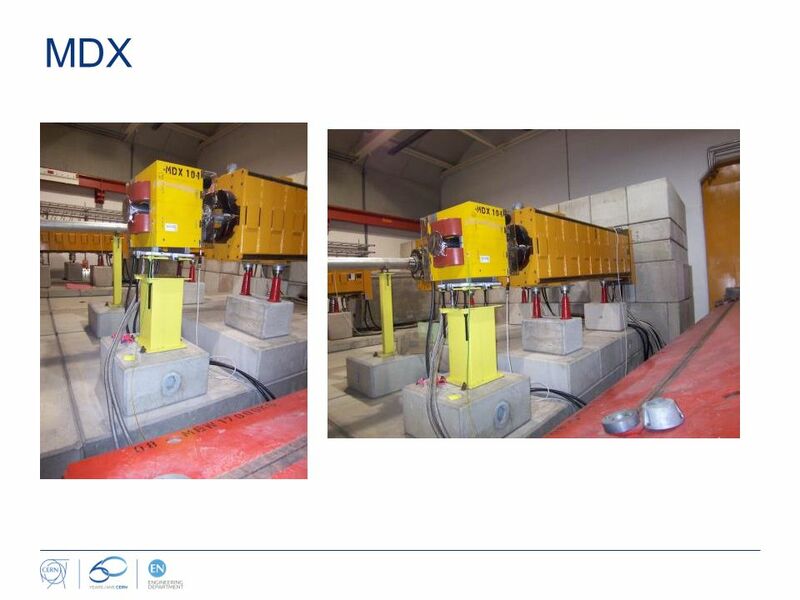 HIGH RADIATION TO MATERIALS WG3 – E XPERIMENTAL A REA HiRadMat project Team Meeting 03/0/2011 T9 transformation Repeatability test of experimental area. 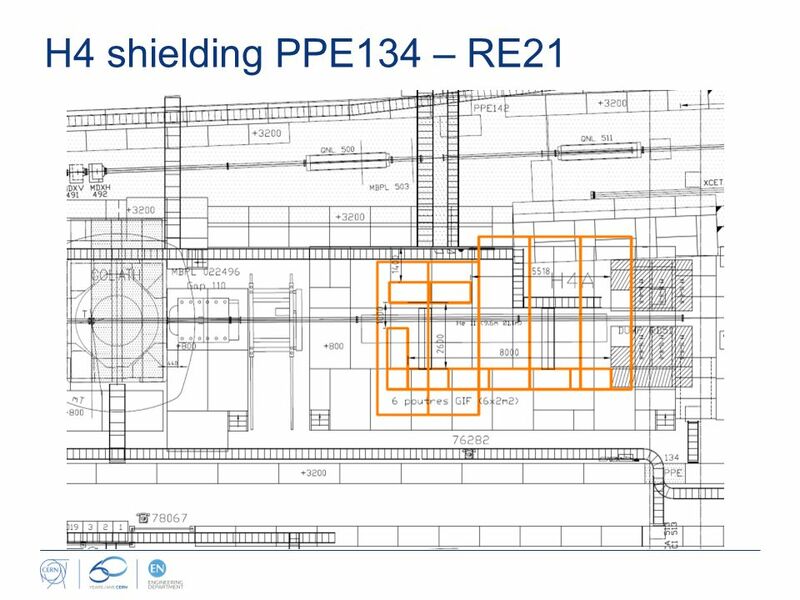 Accelerator Complex Status P. Collier. 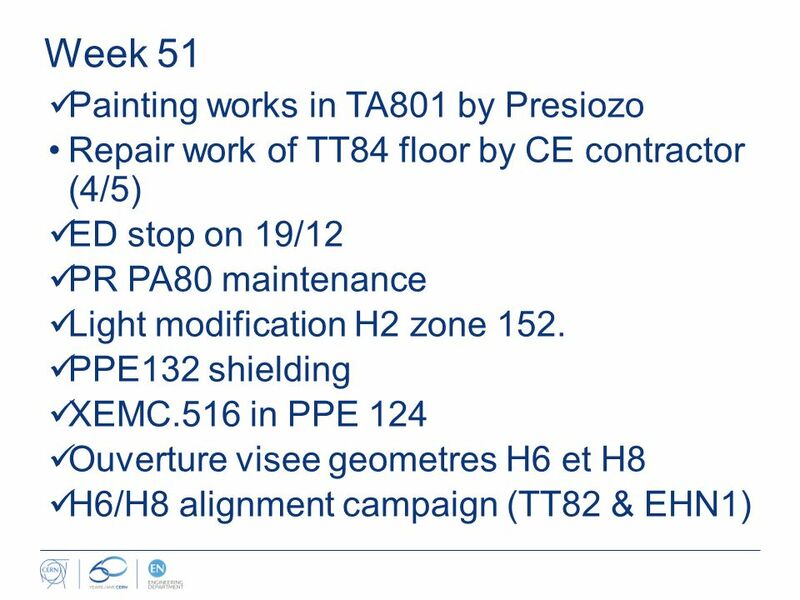 Linac2, Booster and PS Startup on-time, according to the schedule. 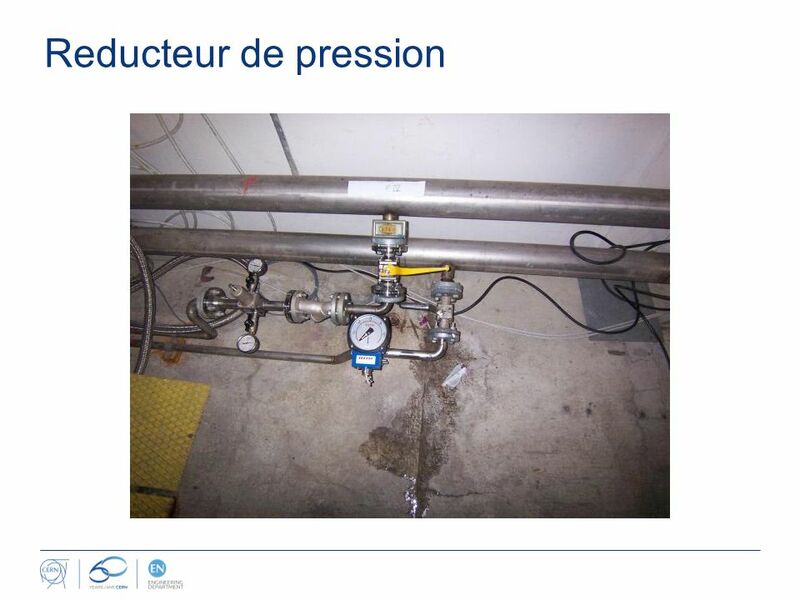 Only minor problems Rapidly set-up the major. HiRadMat : report from WG2&3 – WANF dismantling January 15, 2010S. 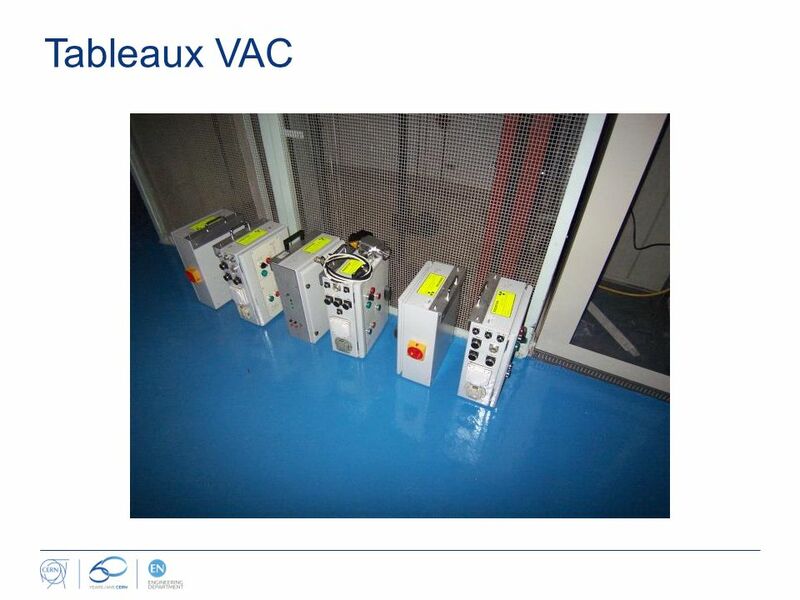 Evrard 1 Worksite: activities achieved or in progress WANF cleaning: status Proposal. Far side Near side -Z End +Z End 5m Wed Dec 7 ECAL CMXZEC CSC REDT+ RBTK FPIXSurvey HCAL TE-VSCEN Dept SL CP Availability. Tests of the LH2 target at GSI 2 nd -4 th april 2014 T. Hennino, C. Commeaux (IPN Orsay) T. Heinz, E. Schwab (GSI) The LH2 target. June 26, 2009TLH, NFMCC Friday Meeting1 MICE Updates MICE News Overview ISIS and MICE Schedules DAQ Review Spectrometer Update Aspirational Schedule Terry. Friday Cyo (Thu. 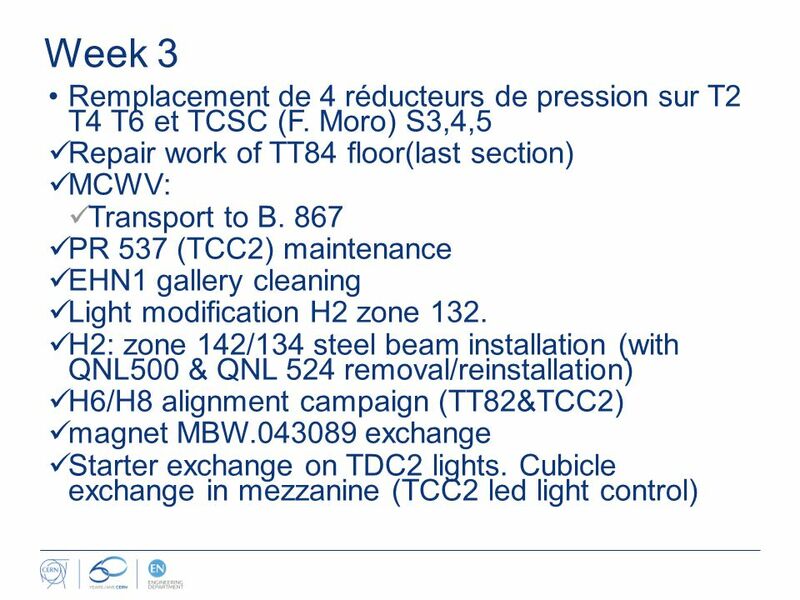 22h) Point 6 – After the energy scan of yesterday afternoon, we have discovered generator B2/MKBH-A (One changed during this TS) has around. 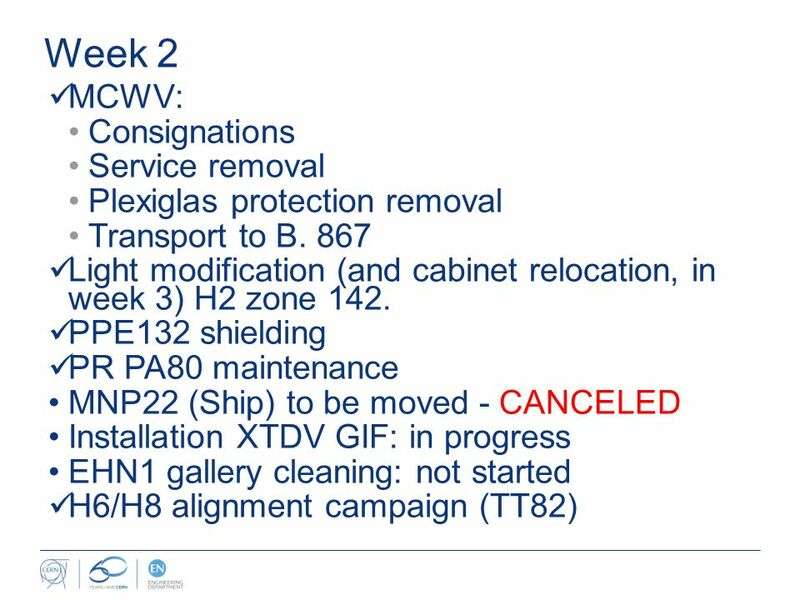 CURRENT STATUS OF CV INSTALLATIONS, WORKS DURING LS1 AND PROBLEMS ENCOUNTERED DURING START-UP NORTH AREA Bill Bannister / Jani Lehtinen EATM – 7 th October. TDC2/TCC2 consolidation EATM 15/07/2014. 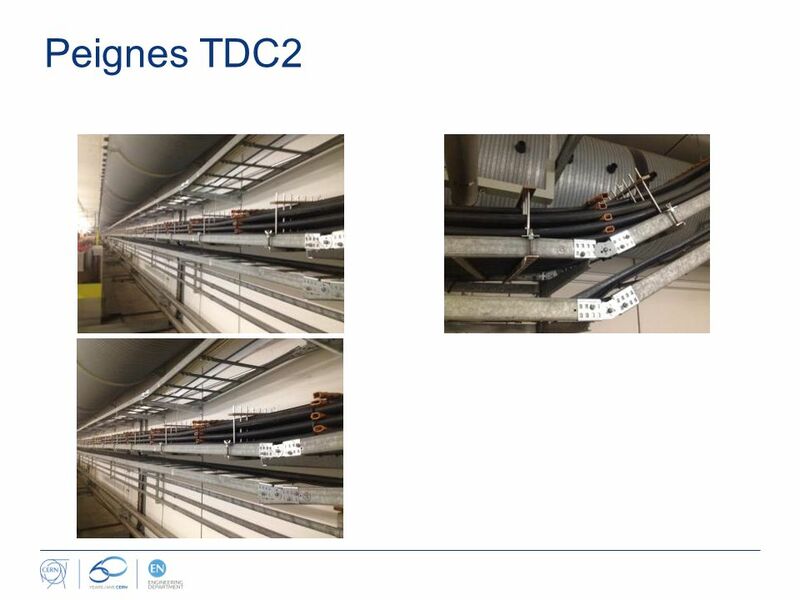 EN/EL – DC and control cable identification and cut completed – Old light removal in TDC2 – New AUG installed. 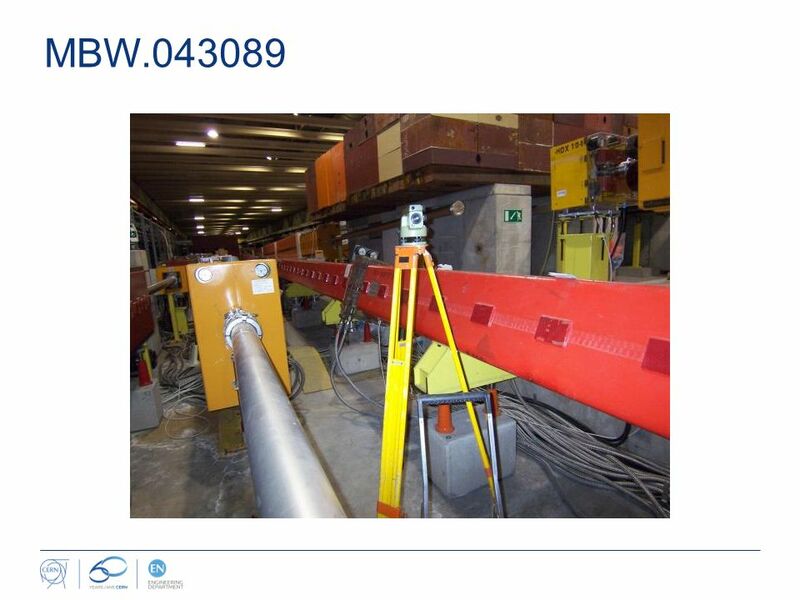 Proton Source Task Shutdown 2014 RFQ Injection Linac Tank 1 to 2 emmittance probe and Collimator NTF Beam Line Repair 400 MeV Turbo Station Replacement. 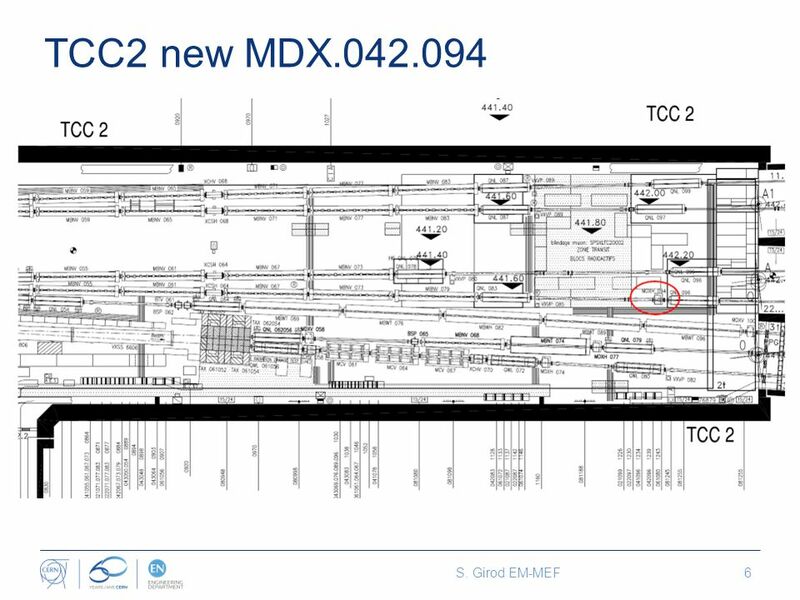 TDC2-TCC2 consolidation status report to EATM EDMS October 7 th, 2014 S. EVRARD, EN-MEF, on behalf of the TDC2/TCC2 WG. 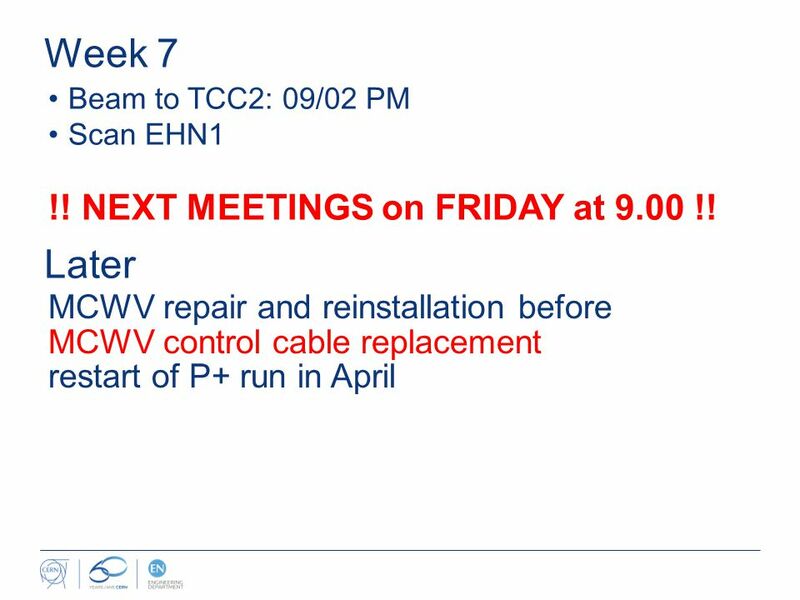 1 Hall A Update Thia Keppel APEX Collaboration Meeting April 2015. S. Evrard — EN/MEF IEFC Workshop, March 08, 2012 TCC2/TDC2 Shutdown Activities and Consolidation Plans On behalf of the TDC2/TCC2. EATM12-08 Contribution NA62 Francois Butin, Lau Gatignon / EN-MEF 4 September 2012. 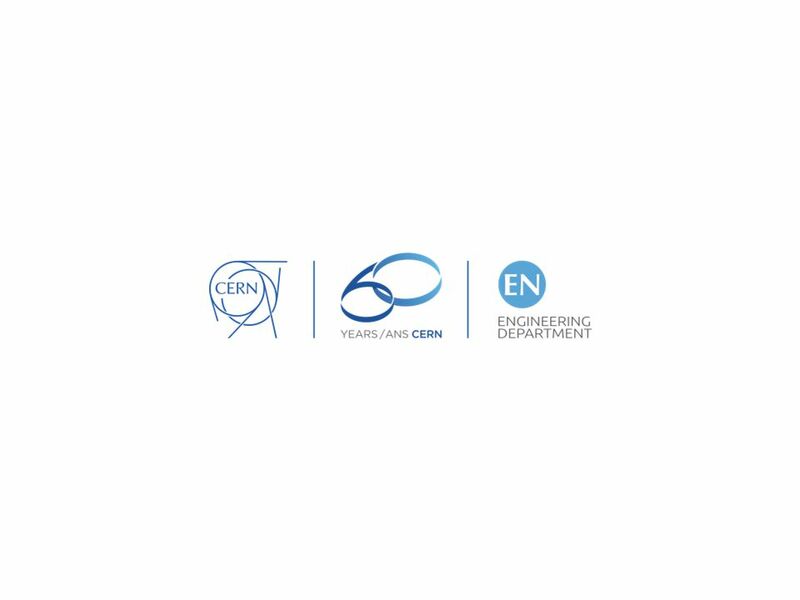 Contributions from BE -ABP -ASR -BI -CO DG -RP EN -CV -EL -MEF -STI GS -SEM -ASE IT -CSPH -CMXTE -CRG -EPC -MPE Follow.